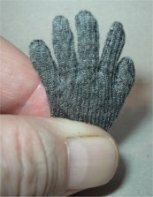 I was asked recently about how I can fit cloth gloves on to plastic hands, I do have a section on one my German Alterations Pages about how I did it. 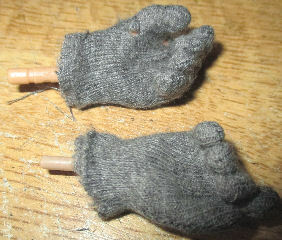 But I found that I needed to expand on it, and if the gloves can be fitted onto some gripping hands. So below I have used some hands from various manufacturers, to show how I have fitted the gloves onto them. I have also made a page about how I have changed the pins on some hands, so that they can be used with other company's figure's wrist joints - Hand Pins. One thing that I had made my mind up about regarding my figure's, are that it had to have the fabric gloved hands rather than the plastic type of gloved hands. And this is shown below about how I fit the gloves to the hands on my figures. Note: This is the easy method, because the hands are flat. In these pictures above Picture 1. is a DiD flexible hand and a fabric glove, in Picture 2. I feed the four fingers into the glove pulling it down slowly until I can get the thumb inside the glove as well. Note: Sometimes I have to squeeze the fingers and thumb together to get them all into the glove. In Picture 3. once they are all in, I then spread the thumb and fingers out as shown to get each one lined up, and I then pull the glove down over them. Then as shown Picture 4. 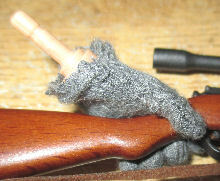 I gradually feed the thumb and fingers into the glove, and as shown Picture 5. 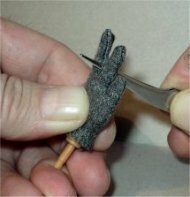 I use a pair of tweezers to press down between the fingers to get them into the glove fully. Note: If you use the tweezers to pull the glove down over the fingers, make sure that you do not use any pointed one's, because it can cause the glove to split. Picture 6. shows how I hold the bottom of the glove and the peg for the wrist joint, and I gently tap the pin on my desk, as this gently forces the hand further into the glove. And with a combination of this and the tweezers, I can finally get the fingers all the way into the glove. With these hands along with the others below, although they are solid they are made of a soft plastic which allows me move the fingers about. With these hands the important part is to use a sharp knife to separate the individual fingers. Picture 7. shows the ends of the fingers, which I carefully cut down halfway with the knife blade. Note: Take your time, make several small gentle cuts to get through the material and do not press down too hard. In Picture 8. I then turn the hand over, and next I repeat the process to get the straight cut linked up. So that I now have four separate fingers, which can now be moved about to get them into the glove. Picture 9. shows how I have started to fit the gloves onto the hand, which is the same as with the DiD Bendy hands. 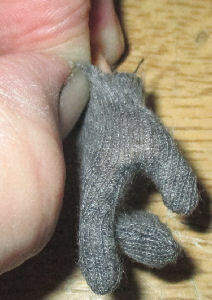 But this time with the now flexible fingers, they can now be bent and stretched to enable me to fit them into the glove. Picture 10. shows how I have started to put the hand into the glove. I then have to get the thumb in place first, and by a case of pinching and pulling the material I can work the other fingers into place. 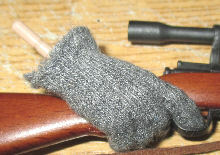 The finished glove is shown above right. This is the same process as above, but with the Soldier Story hands. 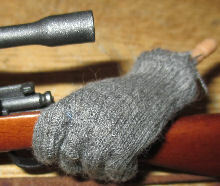 Picture 13. shows both the DiD and Soldier Story hands in the gloves, in the top glove I have accidentally split the material slightly. With this hole I can either move the glove around to hide it, or as I have done before I put in a couple of stitches of Grey thread to sew the material back together again. This is the same process as above again, but now with the Dragon hands. 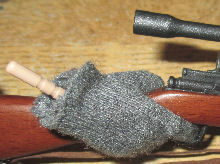 This hand I chose as it has a trigger finger, and again in Picture 17. it is a case of carefully pinching and stretching the glove to get it to fit. Picture 18. once the glove is on in, I just hold the pin and gently pull the glove cuff to finally stretch it into place. In the pictures here I have the various gloved hands holding onto a rifle, some are just a gripping hand where some of the others are trigger fingers. I have looked at the other types of hands that I have here in my spares boxes. bbi - I have not tried this with a bbi hand, as I have found that they are made of a harder type of plastic. So it is very hard to move the fingers about once they have been separated, which could end up with the gloves being torn if I try to fit them. 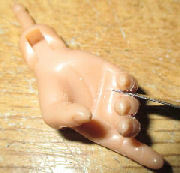 Hot Toys & 21st Century - I don't have any of these hands in my spares boxes, so I have not been able to try this method. DAM - The only hands I have here are the Spetsnaz plastic gloved one's, so I have not tried this method on these hands yet.